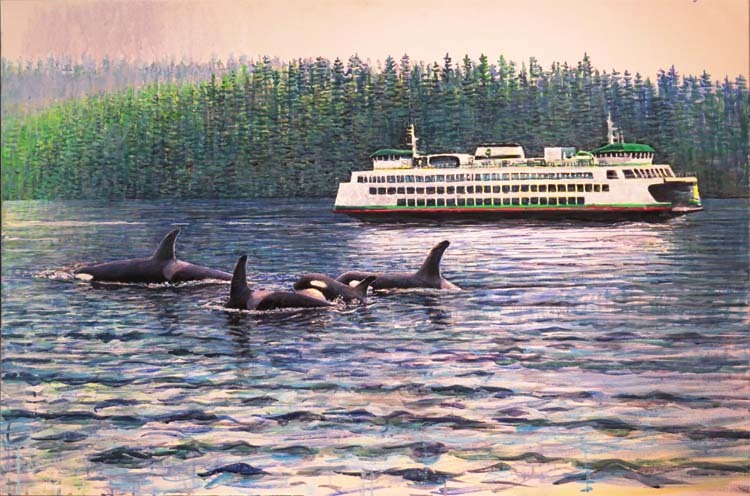 I decided to start four new paintings over the next year that will fall into the Northwest Romantic category. Next is a Bald Eagle, I’ll have plenty to say about that when the time comes. 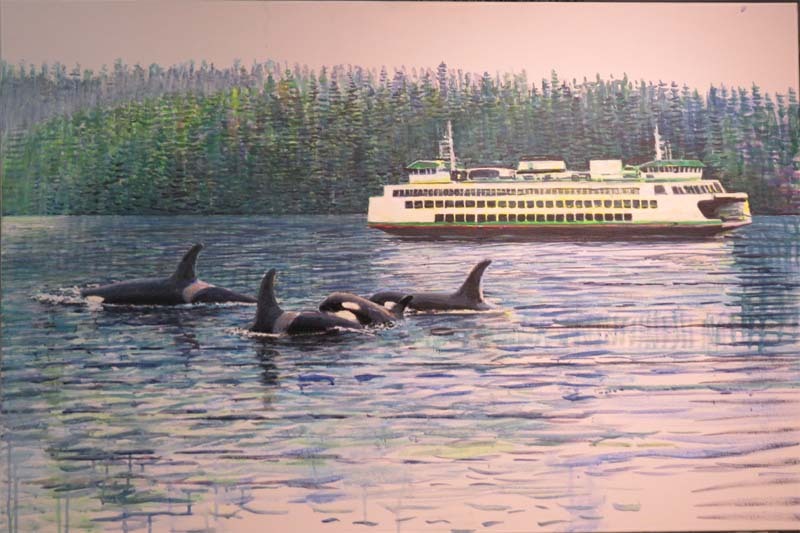 But the first is a ferry and Orcas, two icons that I’ve done before specifically in the painting Lucky Ride, so this has to be the sequel, Lucky Ride II. I’m not sure if this is going to work. I’m definitely worried about it. It breaks composition rules, in fact all the ones I follow, which will be in my forthcoming book by the way. Well, it’s been great fun painting it so far, I’m happy to let it meet the future and if the future wins, that’s fine. I’ve been dinking around on the Bobcat Walking for a long time, but I suddenly believe. I’m in love with this painting now. That’s nice, I was ready to ditch it a few times. 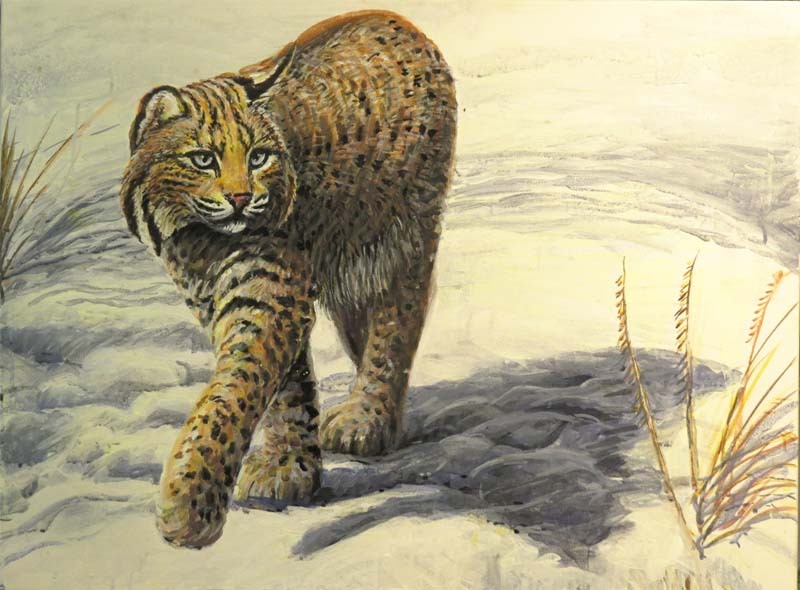 There’s not much constituency for Bobcats, as far as I can tell, but I love them. The last one I saw, walking up a draw in New Mexico, did the Cheshire Cat routine on me, it was there very close and right in front of me, turned to look at me nonchalantly, then suddenly was gone as if it had never been there. Btw, I’m not making that up, others who have seen them will back me up, they make fools of you. And so handsome. 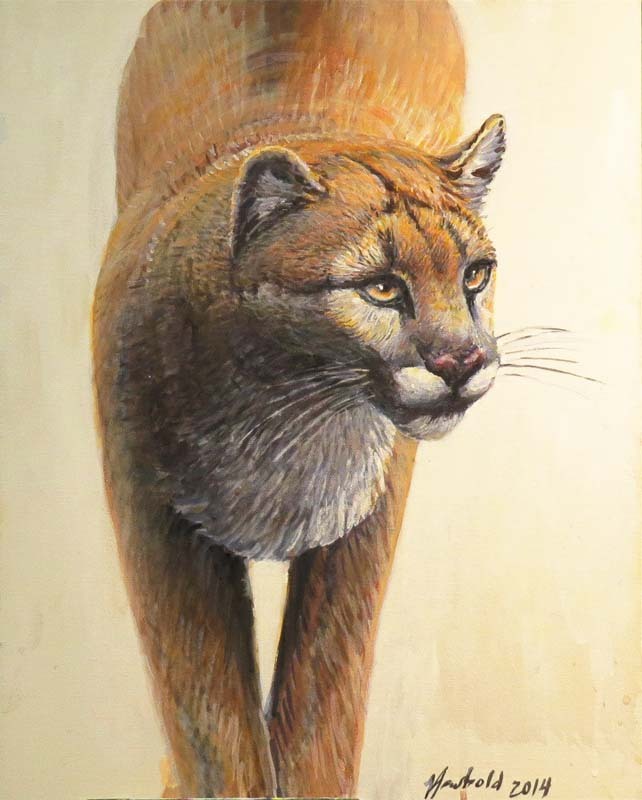 This Cougar is more or less the same, I’m liking it more anyway. Only saw one Cougar, and it was over by Republic, WA. This cat had probably never seen a Prius before, so after crossing the road, it came back to take a look. It was very low light so my shot of that cat wouldn’t have come out except that we were in the Prius and there was no shaking because the engine turns off as soon as the car stops. I’ll see if I can find that shot and put it up, it was a young Tom who seemed naieve and we worried for him with all the old Toms around, not to mention Cougar season coming up. 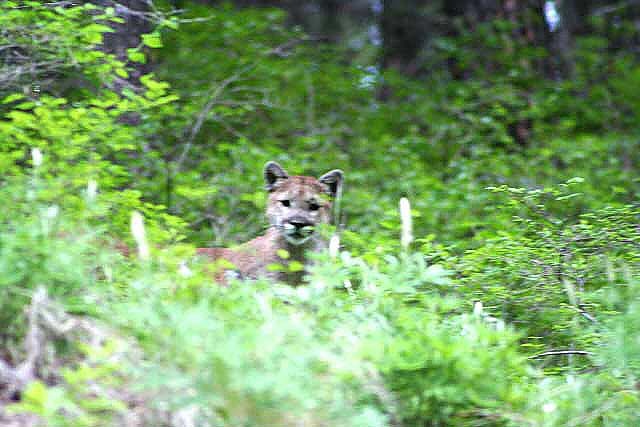 Oh, I found that shot from the Sanpoil River near Republic, WA of a young Cougar that stopped to see what our deal was. 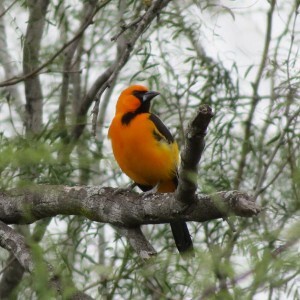 It’s not a great shot, but they are known as difficult photo subjects in the wild, so I’m pretty happy about it. 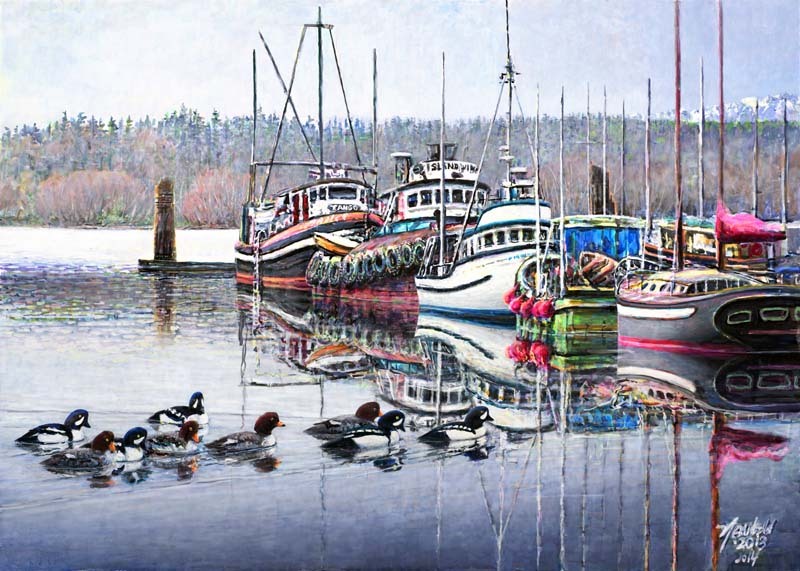 Still working on Poulsbo, and still expecting one more breakthrough. This is it now. It’s October 5 and I’m updating the shot of Lucky Ride II. This painting works for me on the scale of the painting. I’m curious to see how it prints out on paper. It’s possible comments are turned on. Thanks in advance if anyone comments.